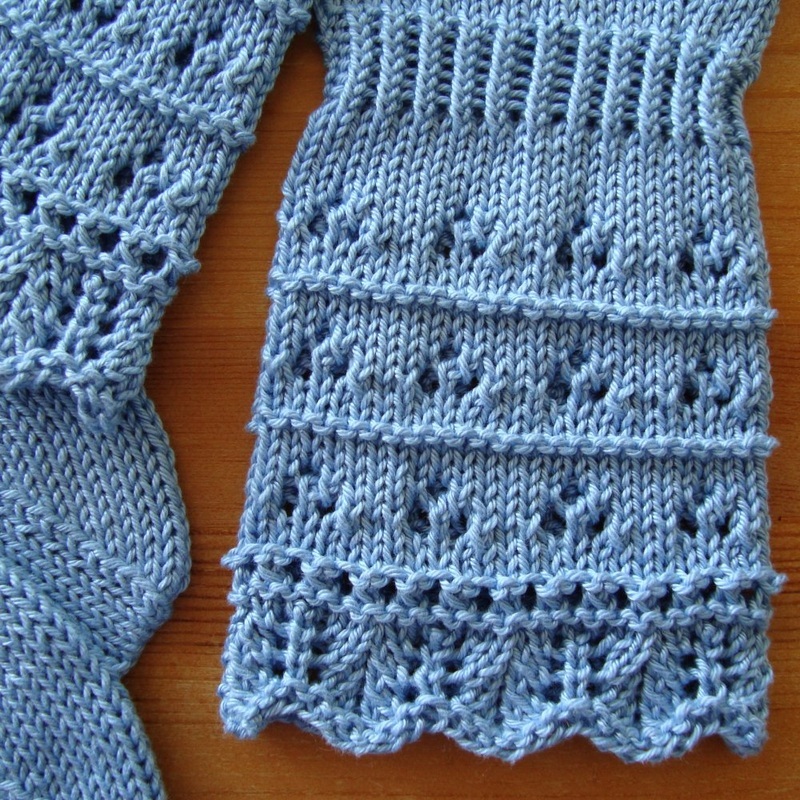 The pattern for the cuffs combines two stitch patterns – the ribbing (k3, p3) and the lace stitch. 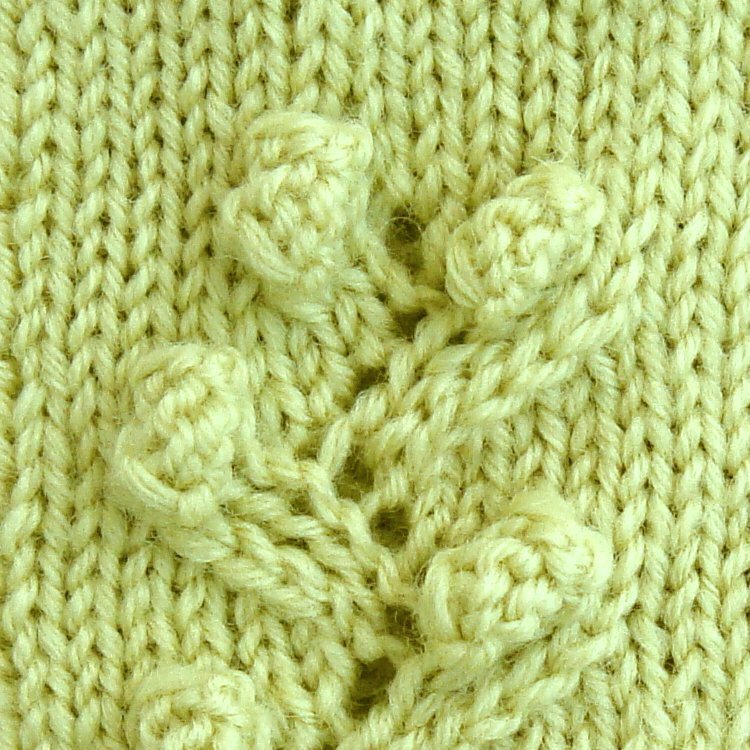 The stitches have different gauge so there is no need to make any shaping - the cuffs are knitted in rounds having the same amount of stitches all the way through. This makes the pattern quite simple! 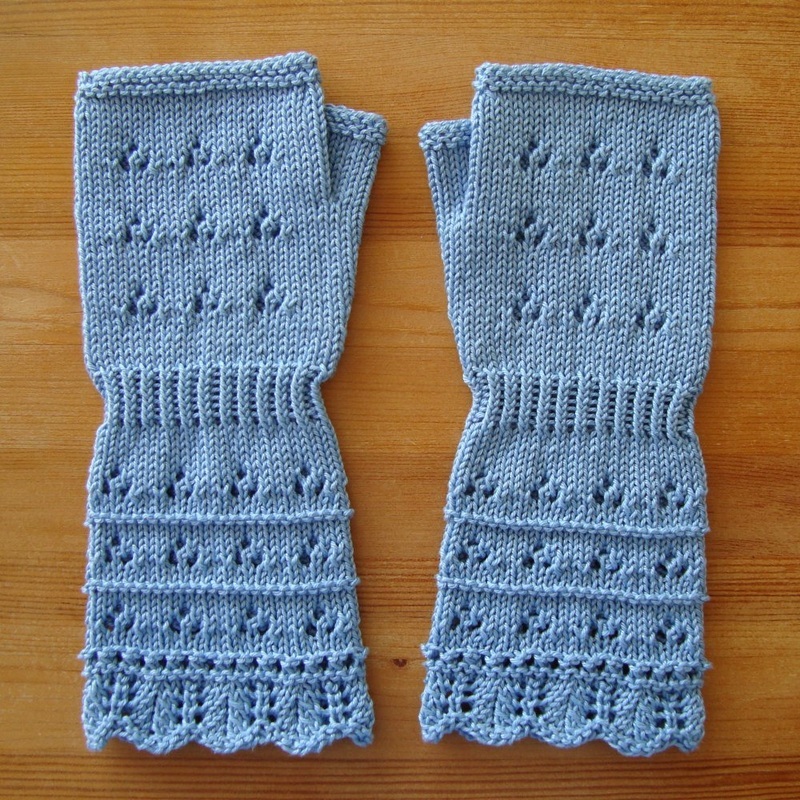 These mittens are easy to knit, yet very elegant. 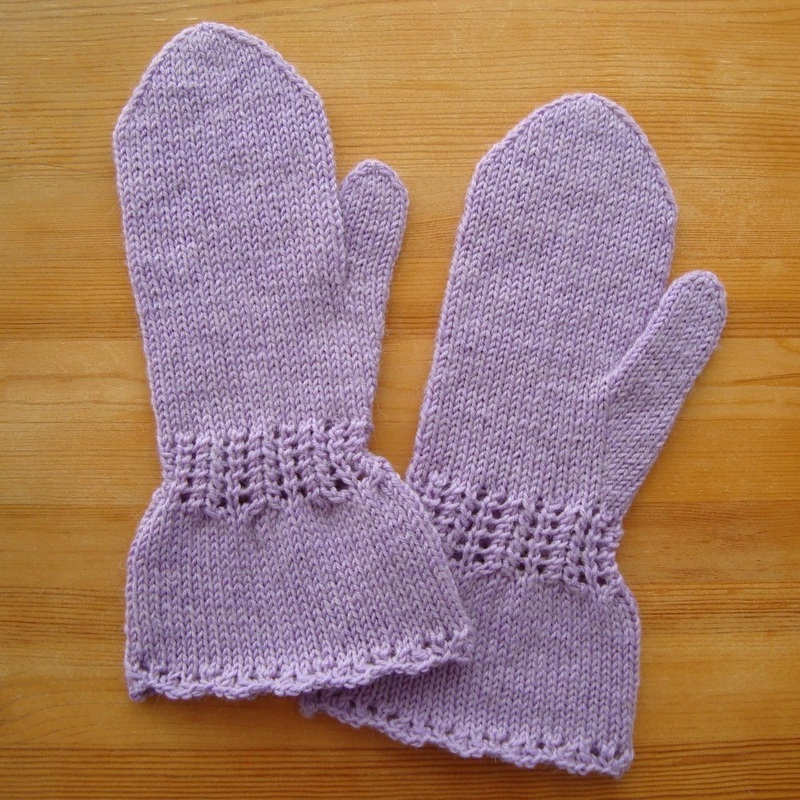 The textured part of the mittens is worked in a lace stitch – but if you want to have a more dense fabric, you can substitute 'yarn over' in the pattern with 'make one'. 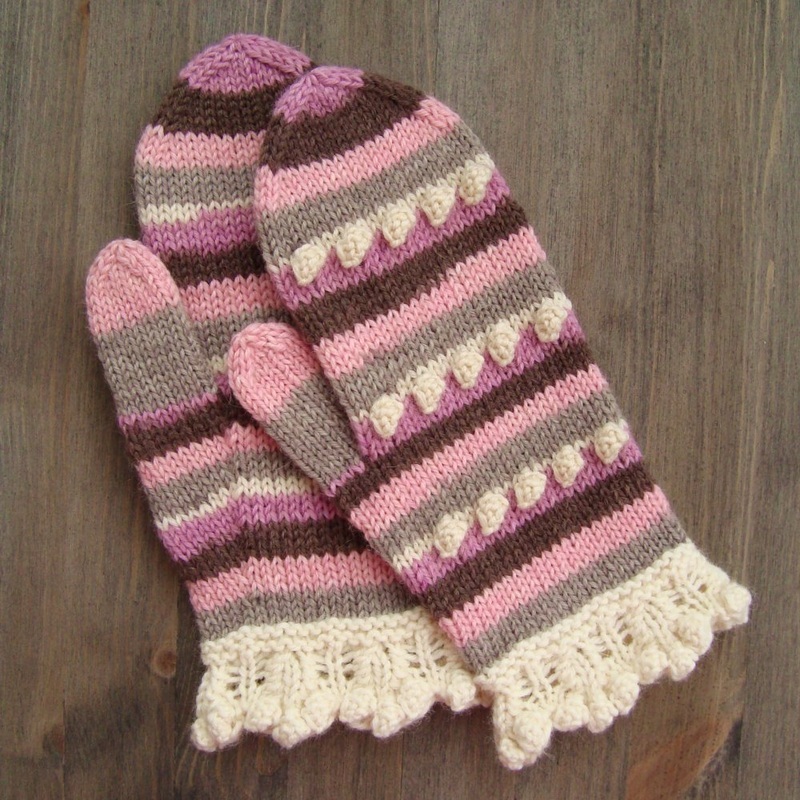 The idea for this design is to use a self-striping yarn and to apply a stitch pattern for only one color. 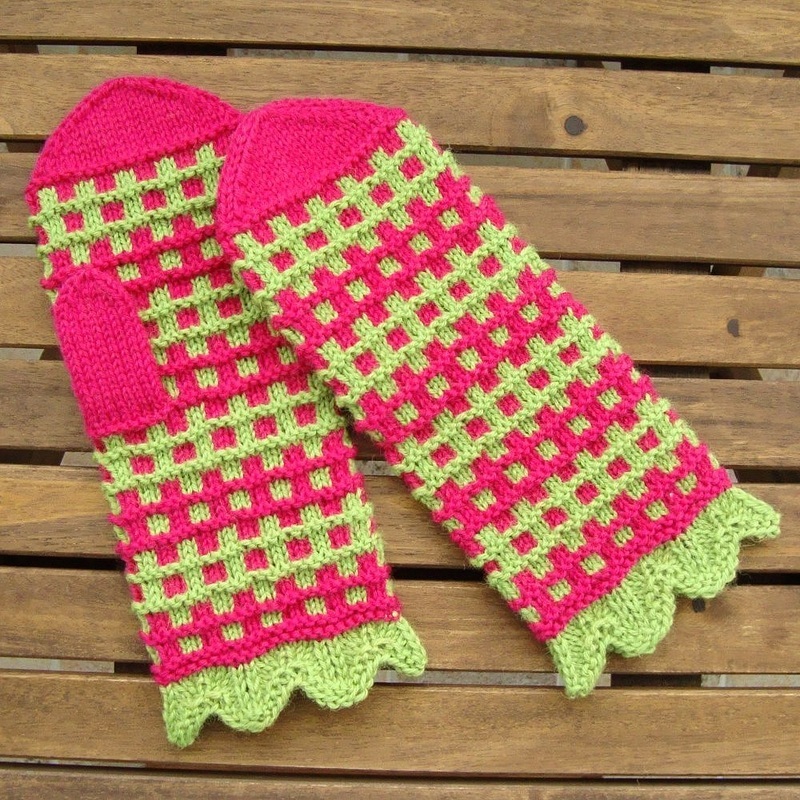 The stitch pattern that I've chosen is bobbles. 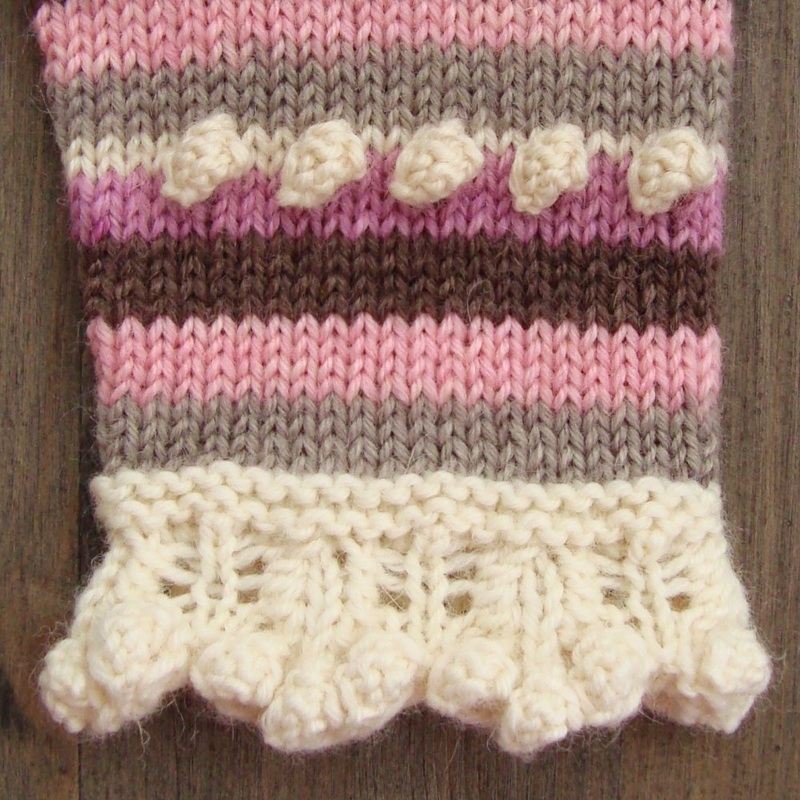 It's a three-dimensional stitch pattern, so I've applied it only on the back side of the mittens. 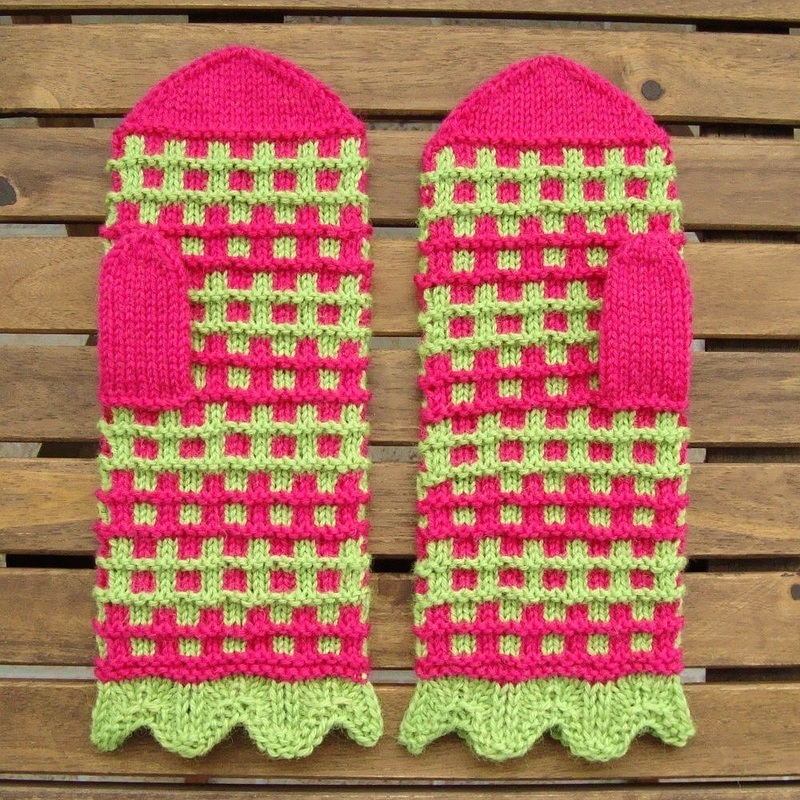 The edgings are knitted in one-colored yarn that matches the self-striping yarn. 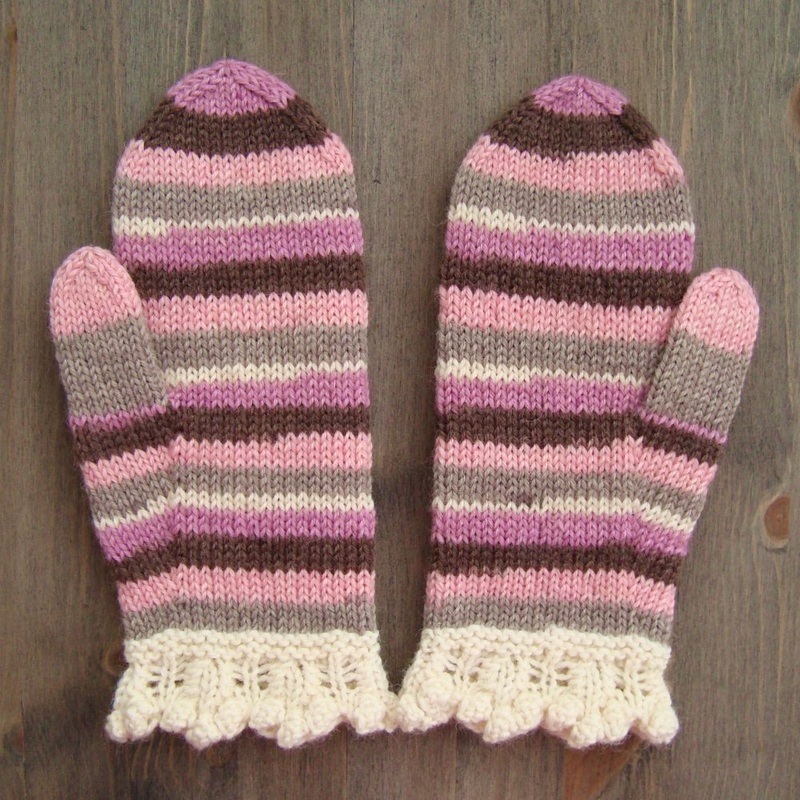 The length of one color of the self-striping yarn is approx 2,75 m.
The mittens are knitted in a two-color-pattern using slip stitch technique, so there is no knitting with two strands at a time. I've chosen bright contrasting colors, which make each other appear even more brighter. 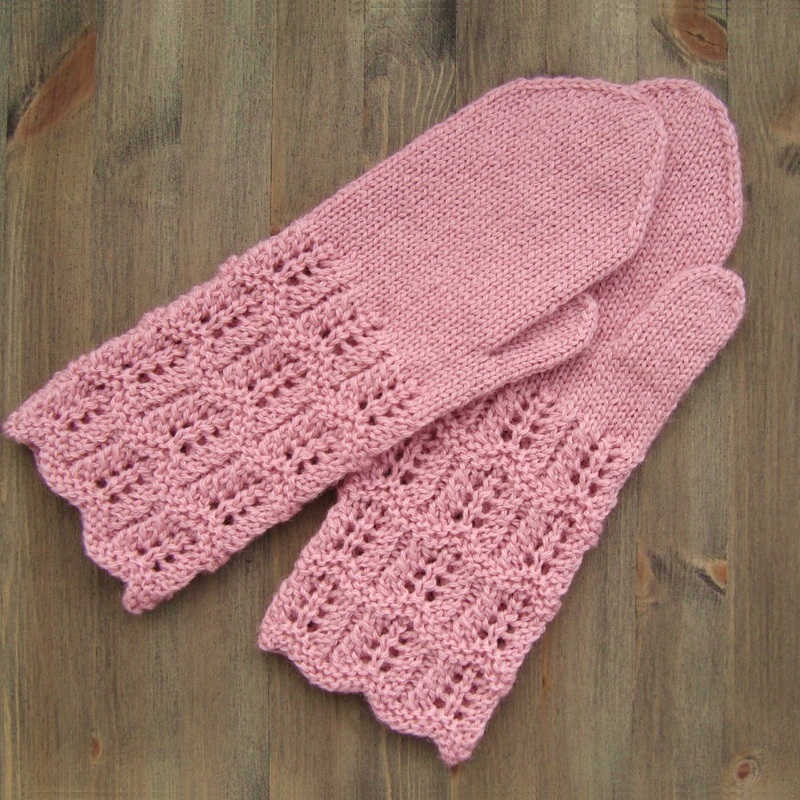 But the mittens would look as good even in a more gentle color combination. 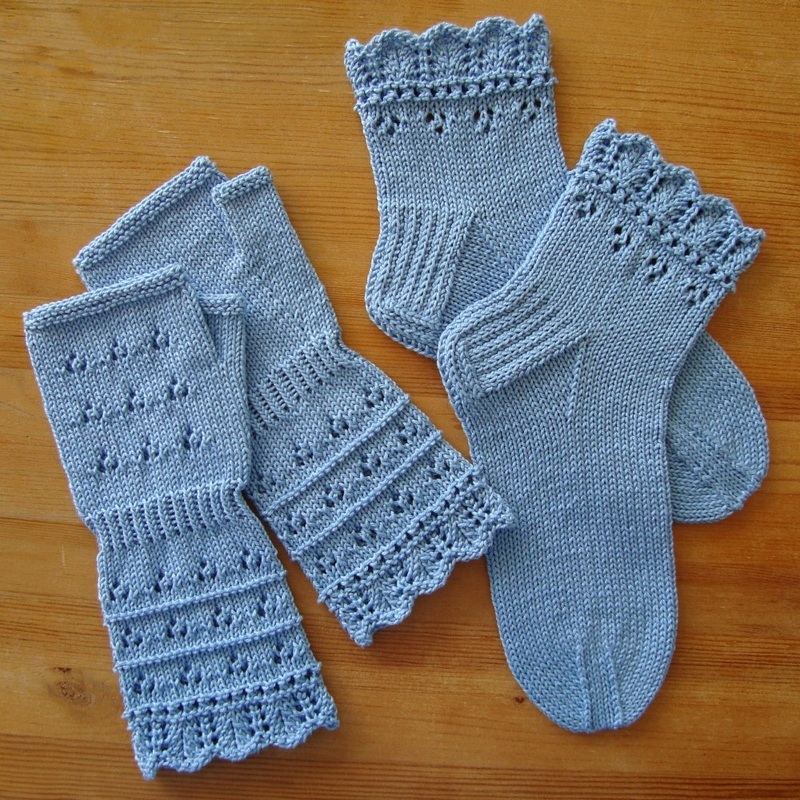 This set of fingerless mittens and ankle socks is knitted in cotton and suits well to be used in summer. I've chosen a bright blue color which reminds me of the summer sky, but I can visualize this model in any other bright color. - Feel free to choose the one you like! 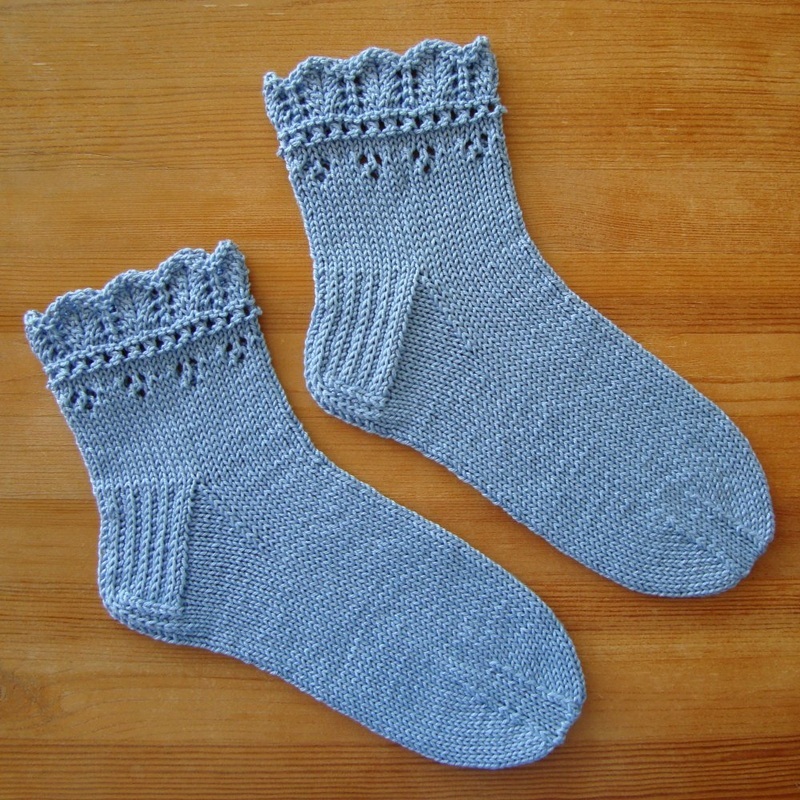 If you want to use the items in colder seasons, make them in wool or wool blend. 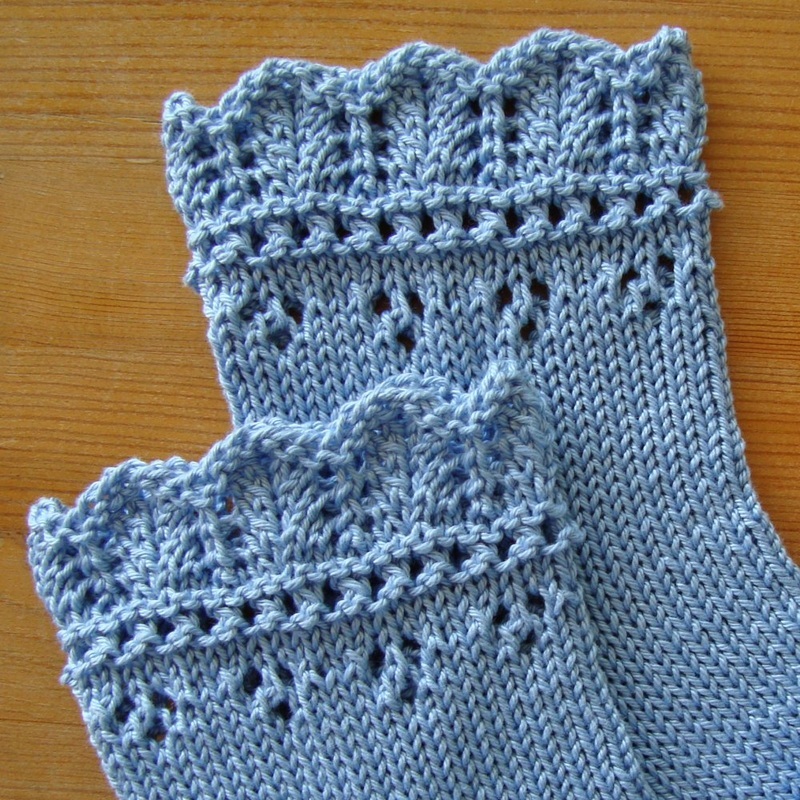 Note that in this case you can knit the cuffs of the socks longer working them in the same way as for the mittens. 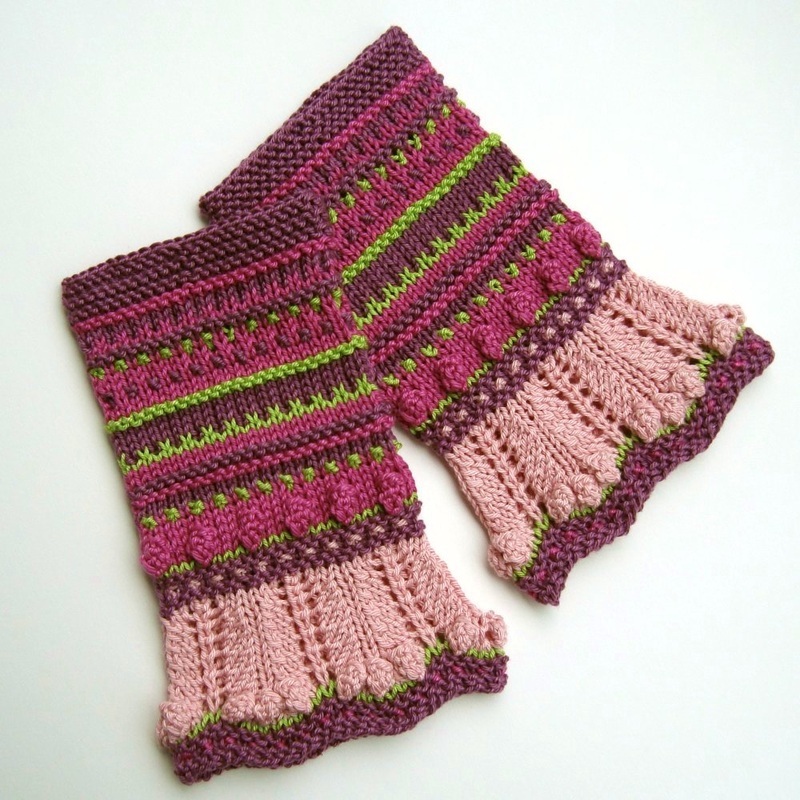 These cuffs is a mixture of colors and stitches. They may seem complicated to make, but they are really not. 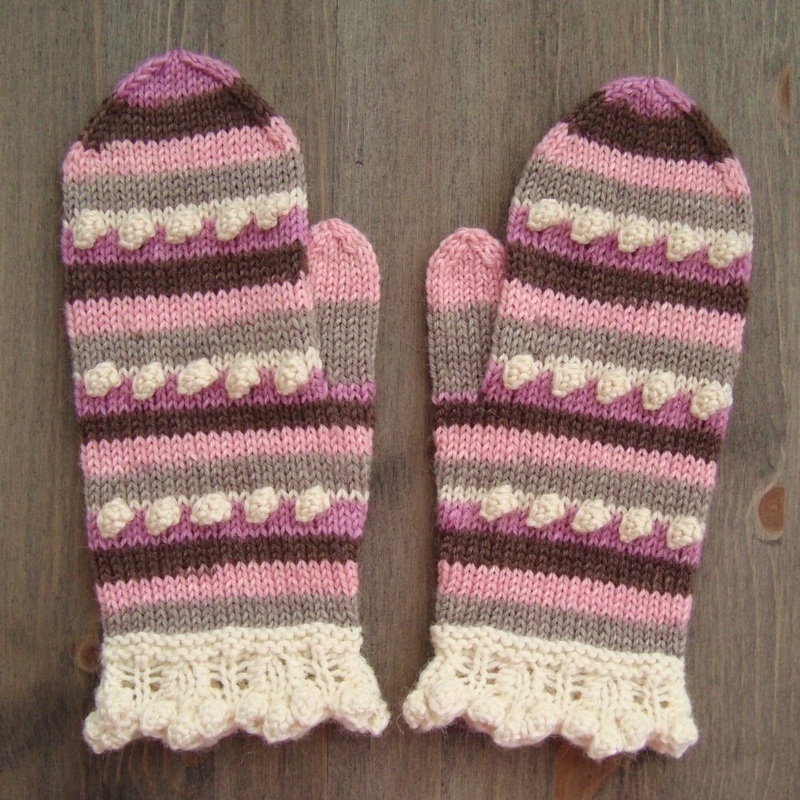 The color patterns are made using slip stitch, so there is no knitting with two strands at a time! 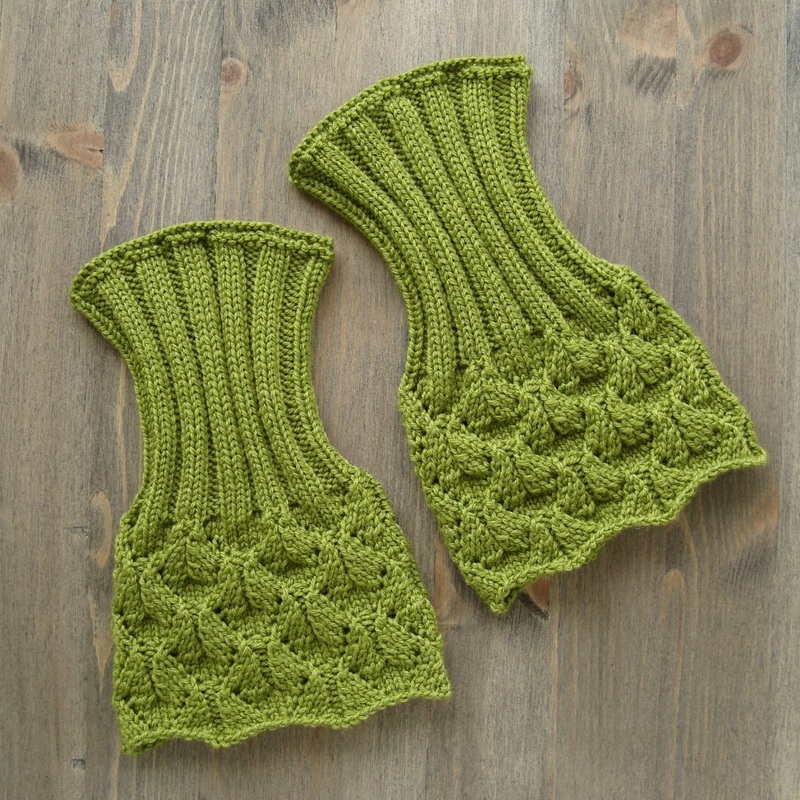 When I a few weeks ago saw this new color of a yarn, I knew immediately what I want to use it for. It's a light yellow green, maybe it would be more right to say soft yellow green. When I look at this lovely shade I can't avoid thinking about spring. So I knew this was a perfect yarn to make a pair of gloves that you can wear in springtime when the days a shiny but still cold. 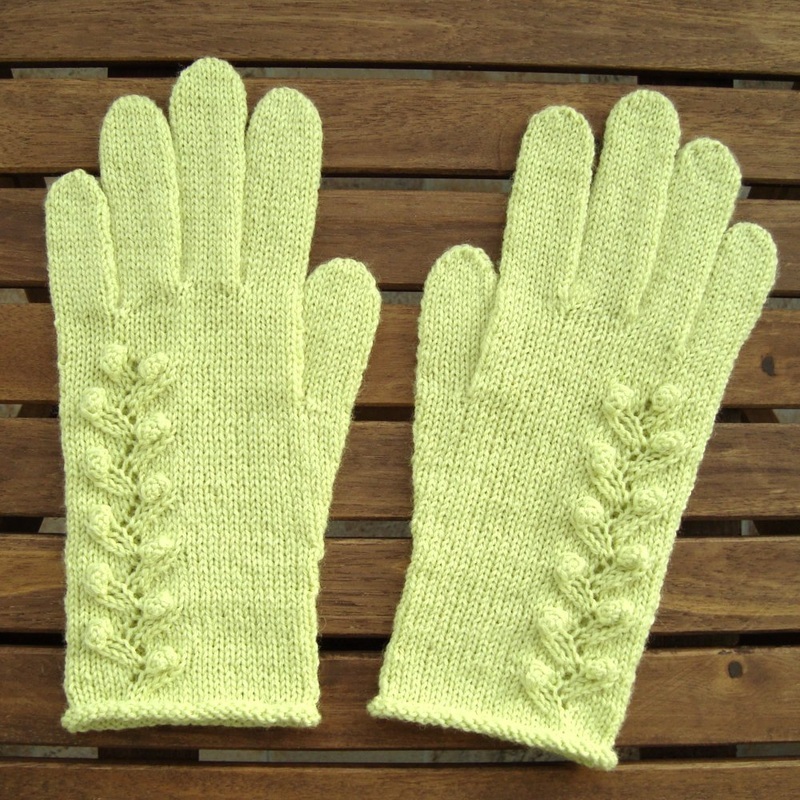 To create a springlike feeling even more, I decorated the gloves with a lace stitch pattern with bobbles which I believe represents quite well a spray in buds. 23. 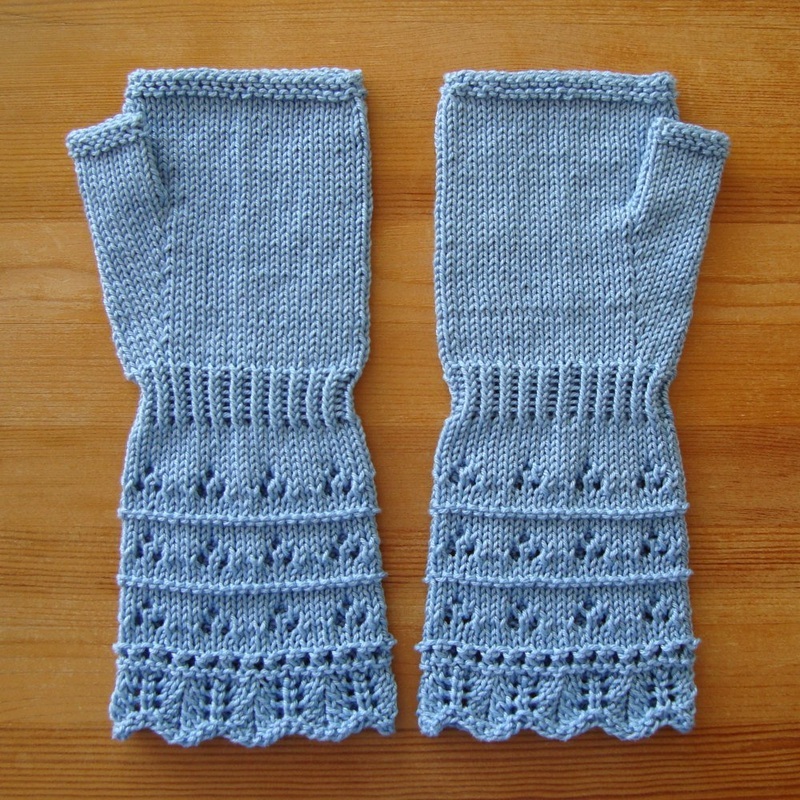 Cuff Mittens With a Lace "Bracelet"
Inspiration for these mittens came from the thought of making the mittens with a bracelet. 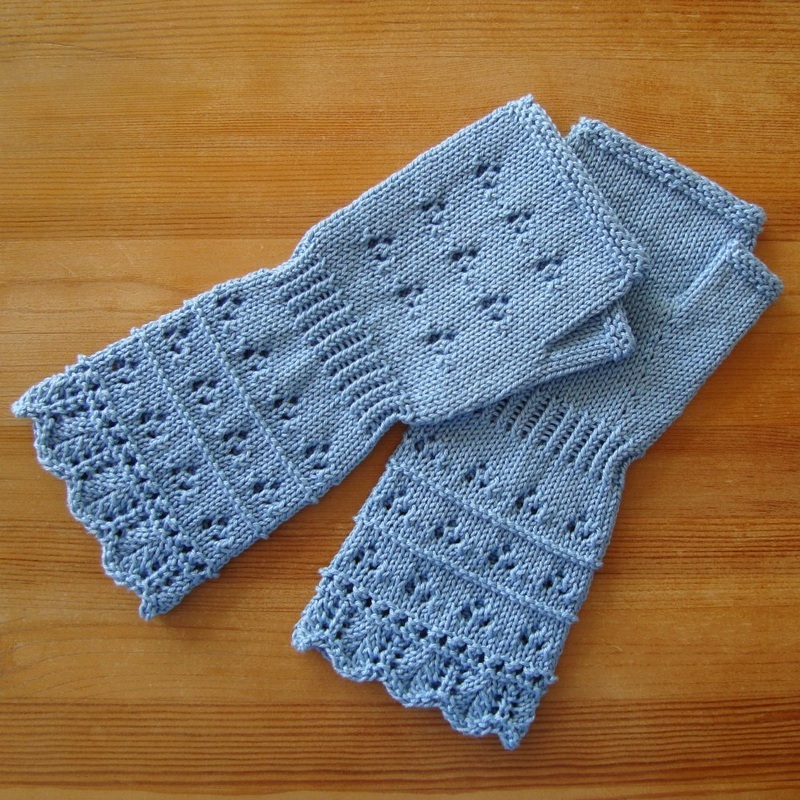 As I wanted the mittens to be easy to knit I made the bracelet as a part of the mittens and I used a lace stitch pattern for it. 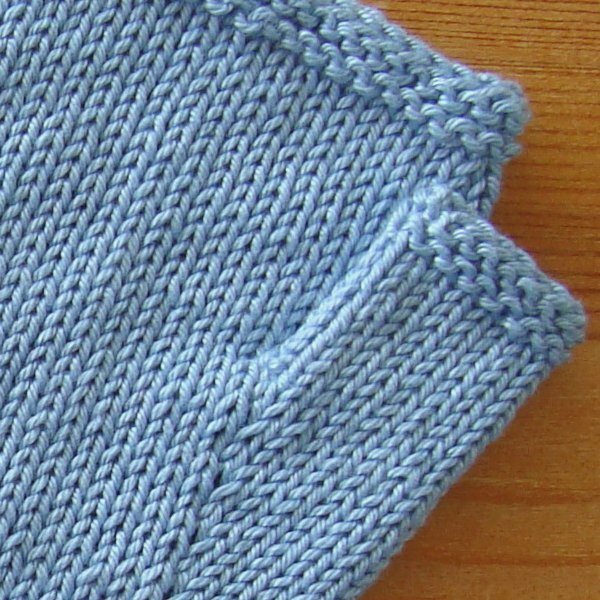 To make the bracelet show off better I made a large cuff and used a simple stockinette stitch all over the mittens. 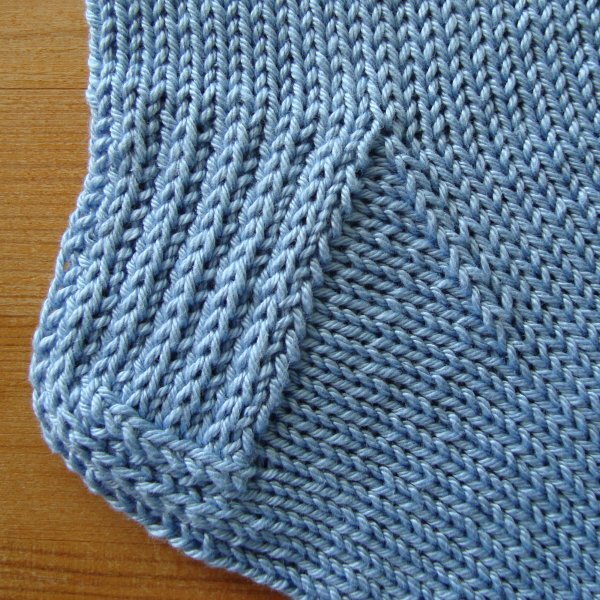 The cuff edging is decorated with one round of the same lace stitch pattern that was used for the bracelet.